A weak area of belly wall can let tissue poke out of the belly. This is called a hernia. A hernia repair is a surgery to push the tissue back where it belongs. The wall of the belly will also be fixed. Large hernias and those that cause pain will need repair. The hernia will not heal without surgery. 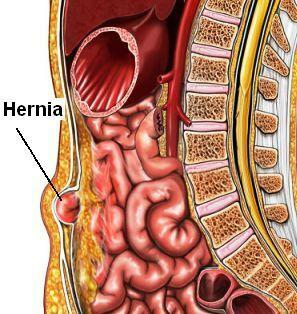 The pain and size of the hernia can increase over time. Tissue that pokes through the hole can become trapped. If the blood flow is cut off to the tissue it is called a strangulated hernias. This is an emergency. Immediate surgery will be needed. The doctor will review tests that have been done. Your overall health will be checked. You may need a physical exam if it has been a long time since your last exam. Talk to your doctor about any medicine or supplement that you take. Some may need to be stopped up to 1 week before the procedure. Shower the night before, using antibacterial soap. Wear comfortable clothing to surgery. Arrange for someone to drive you home and to help you at home. Stop smoking before the procedure. Local anesthesia—the area will be numbed. You will be awake but given medicine to help you relax. Spinal anesthesia—lower half of your body will be numb. Medicine is passed into fluid around spine. Conventional (open) surgery—cuts are made in the belly. The surgeon will be able to see the area directly. Laparoscopic surgery—smaller cuts are needed. Special tools will be passed through these cuts. You and your doctor will talk about your options. Laparoscopic tends to have a faster recovery. However, it is not appropriate for everyone. Weaker muscles may be sewn together. A large opening or one in the groin may need mesh support. The mesh will help to create a new wall. If mesh is used, the muscle is not sewn together. The cut will be closed with stitches or staples. Small cuts will be made around the site. A tube will be passed through a cut. It will push gas into the belly. This will make it easier for the surgeon to work. A camera will allow them to see inside the belly. Other tools will be passed through the cuts. They will be used to repair the area. Tissue will be pushed back into place. The belly wall will be closed. The cuts will be closed with stitches or staples. A dressing will be placed over the cuts. A care team will watch over your vital signs until you wake. Fluids and pain medicine will be given through an IV. Anesthesia will prevent pain during surgery. You will be sore for at least 24 to 48 hours after surgery. Medicine will help to manage pain. You will be encouraged to walk the day after surgery. It may take about a week to return to normal activity after laparoscopic surgery. Open surgery may take a bit longer. Some activity will need to be avoided during recovery. This includes straining and heavy lifting. Groin hernia in adults and adolescents. EBSCO DynaMed Plus website. Available at: https://www.dynamed.com/topics/dmp~AN~T113880/Groin-hernia-in-adults-and-adolescents . Updated March 14, 2018. Accessed March 26, 2018. Inguinal repair surgery information. Society of American Gastrointestinal and Endoscopic Surgeons website. Available at: https://www.sages.org/publications/patient-information/patient-information-for-laparoscopic-inguinal-hernia-repair-from-sages/. Updated March 2015. Accessed January 7, 2019. Laparoscopic surgery for hernia repair. Cleveland Clinic website. Available at: https://my.clevelandclinic.org/health/treatments/6905-laparoscopic-surgery-for-hernia-repair. Updated March 1, 2017. Accessed March 26, 2018.